Palestine Liberation Organization blames Israel for the American decision to cut funding to UNRWA. The Palestine Liberation Organization (PLO) on Tuesday blamed Israel for the United States’ decision to cut its funding to UNRWA, the UN agency for “Palestinian refugees”. A State Department official had said earlier that the United States had sent $60 million to keep UNRWA in operation but withheld a further $65 million. "There is a need to undertake a fundamental re-examination of UNRWA, both in the way it operates and the way it is funded," the official explained. "This administration is thereby targeting the most vulnerable segment of the Palestinian people and depriving the refugees of the right to education, health, shelter and a dignified life," she said in a statement quoted by the Palestinian Arab news agency Wafa. 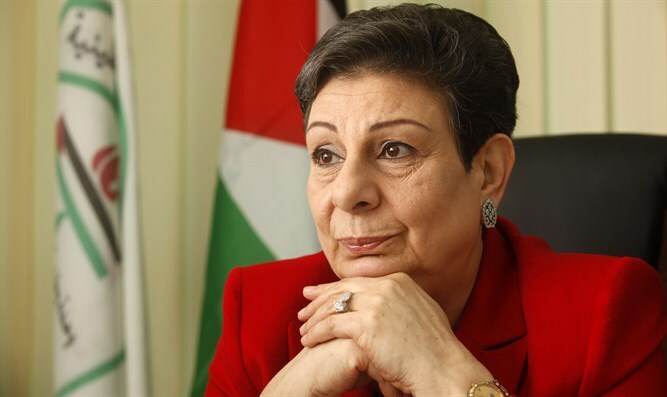 Ashrawi said the U.S. with this decision "is also creating conditions that will generate further instability throughout the region and will demonstrate that it has no compunction in targeting the innocent." "Once again the U.S Administration proves its complicity with the Israeli occupation by attempting to remove another permanent status issue off the table," she concluded. Tuesday’s announcement from the State Department came after the U.S. had frozen a $125 million grant to UNRWA earlier this month, amounting to one third of the U.S. annual aid to the organization. The move follows recent tweets by President Donald Trump in which he questioned the wisdom of providing hundreds of millions of dollars in aid to the Palestinian Authority given their refusal to resume peace talks with Israel. Palestinian Arab officials are already furious with Trump over his recent recognition of Jerusalem as Israel’s capital. On Sunday, Palestinian Authority chairman Mahmoud Abbas lambasted Trump, attacked the State of Israel, and denied its right to exist. Abbas said in a speech before the PLO Central Council that "they wanted to bring the Jews from Europe to protect the interests of the Europeans in the region, and they asked the Netherlands, which had the largest fleet in the world, to transfer the Jews." According to Abbas, "Israel is a colonial project that has nothing to do with the Jews."